Lorne Michaels is a comedic genius, sure. But from what I know from people who have worked at “Saturday Night Live,” Michaels rules his comic fiefdom with an iron hand. So what’s he got against a little diversity? The lack of African American females on SNL is like a blackhead on the face of a skin problem that goes beyond black. Why does Michaels make me pine for Horatio Sanz? He even satirized the show’s failure when he put through Kerry Washington through multiple costume changes. It was a funny self-effacing bit, complete with a scrolling full-screen, semi-mea culpa, and capped off with Rev. Al. So maybe it’s a sign Michaels means business this time. I just hope Rev. Al was more than a comic prop and puts as much heat on SNL as he would on any other entity with SNL’s diversity record. In terms of all other ethnicities, SNL just seems too quick to use old show biz conventions: heavy make-up and wardrobe. 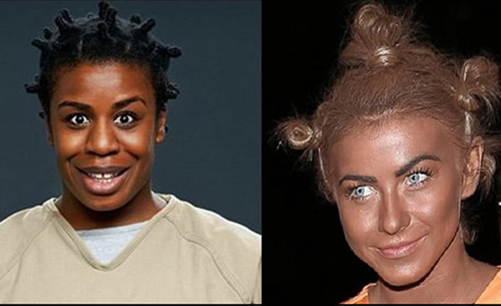 If you were upset when “Dancing with the Stars” member Julianne Hough showed up recently for Halloween in blackface as her homage to “Orange is the New Black,” then you should be upset with the SNL way of handling the problem on a major broadcast. For my pesos, Rob Schneider, half-Filipino, half-white and from the San Francisco Bay Area, was always my favorite on the diversity front at SNL. He could play a Latino generalissimo, an accented Asian guy, or a nerdy white guy by the copy machine who played that stupid name game. And his Elvis? Wicked. But a look at the current cast (that comes back without designated ethnic man, Fred Armisen), leaves us with a limited range for comic diversity. When Armisen actually stopped playing Obama and Jay Pharaoh thankfully stepped in, I thought the SNL playbook had changed for the good, and that we’d start seeing something a little closer to modern diversity standards. At the very least, let’s hope we see more black, Latino, and Asian extras at least in the background. In the old days, when the main cast was called the “Not Ready for Prime Time Players,” I guess you’d call these folks the “Not Ready for Not Ready for Prime Time” players. People of color, of course, on the margins, for play. No different from real life. But instead, SNL serves up the same old, same old. For goodness sakes, it’s 2013. Bobby Moynihan in Asian drag—again—is no longer funny. Diversity? Pass the make-up. Get the plus-sized dress. Granted, Kenan Thompson in a dress is funny. But a built-in laugh gimmick is limited. You’re just taking out the whoopee cushion. It can’t compare to the comic depths that could be mined if you actually had a black female in the cast. That is, of course, the reason why a show would want diversity. Realistic, richer satire, right? The talent is out there. The Groundlings in LA; Second City in Chicago. I saw current SNL cast member Aidy Bryant in Chicago two years ago, and she wasn’t even the best person in the show I saw. The standup scene is also rich with talent. Just this past weekend, I saw a great young Asian American standup, Ali Wong. (Wong, coincidentally, is in New York City at Stand Up NY this week.) I could see her on the show. But showbiz is always about timing, knowing someone. And Michaels’ whim. But I think we’ve reached a point where that’s not going to cut it anymore. When a satircal show self-satirizes and becomes a target for itself, it’s a clear sign of trouble. The jester is now king. Satire works because it comes from a moral place. When it self-satirizes, it’s no longer the underdog, it’s the overdog. Full of itself and ripe for a massive pin prick. Lorne Michaels, the cultural czar for the institution that SNL has become, should listen to the rumblings of the little people. With a diverse cast and some diverse writers, SNL would be vastly improved, sharper, more relevant, and, dare I say, maybe even…funnier.